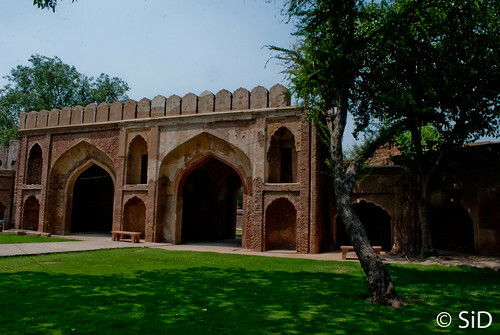 Kashmiri Gate of the Shahjanabad (old Delhi) was the way out to the North side of the city – facing towards Kashmir, as the name suggests. This can also be termed as the most important one as out of all the gates, only this one had an entrance with double gateway. Today, the inter-state bus terminus(ISBT), which is known by the same name has become a symbolic representation of this gate by being a point where people come and exit the city of New Delhi. The actual Kashmiri gate lies anonymously on the side of a road under the colossal shadow of the ISBT metro station. Surrounded by buildings, it is one of the busiest areas in Delhi and as you enter the compound you can very well lose your sense of direction and wonder whether you are standing inside the erstwhile Shahjanabad or outside it. But one look at the gate is enough to tell you. 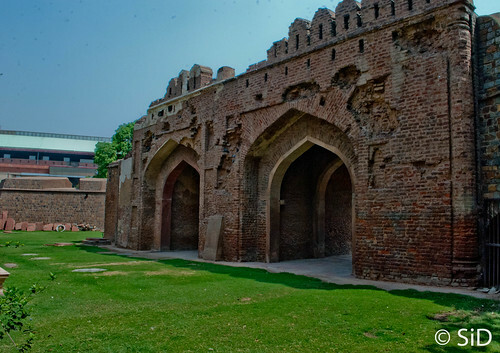 During the 1857 mutiny, five months after the Indian soldiers had taken over the city, the British launched an attack at the city through the Kashmiri Gate. They pounded it with Canons and the damage from those canon balls is still preserved. So if you are facing the side of the gate with these damaged walls, you are actually outside the old city and standing at a point which once used to be a moat around the walls. On the inside, some part of the wall is still standing with the barracks built into these walls. It is rather interesting to see some photographs of the gate during late 1800’s and run your imagination around them.